Older Version Levain Copycat Cookies. In the bowl of a stand mixer, beat the cold butter until it is creamy. Add the sugar and continue to beat for about 4 minutes, scraping sides of bowl often. In a separate bowl, mix the flour, salt, baking soda, baking powder, cornstarch (if using) and dry milk powder (if using).bowl..
Gradually add the flour mixture stirring just until mixed. Pull the dough out and divide it into 8 pieces, form into large flat rounds. Alternatively, you can divide the dough into seven pieces for even larger cookies. The cookies will be giant either way! Put the formed dough balls in a zipper bag and chill overnight. This will help them hold their shape. If you are using convection, preheat to 350℉ convection and bake cookies for 18-20 minutes or until the top starts to crack. Allow the cookies to cool for at least an hour before serving. If you are using a regular oven, bake at 375 for about 18 to 20 minutes or until tops start to crack. Let cool for about 5 minutes on the cookie sheet, then remove and finish cooling on a rack. I've tested these with all kinds of flour combinations and like bread flour the best because it makes the cookies fatter and gives them a harder shell. You can use bread flour, a combination of bread and all-purpose, bread mixed with cake -- whatever works best in your kitchen. As for the butter, I used to always make these with Plugra or HEB European style, but when I started testing with other brands of European style butter I had mixed results. Land o Lakes seems to work just fine, though the cookies might spread a tiny bit more. 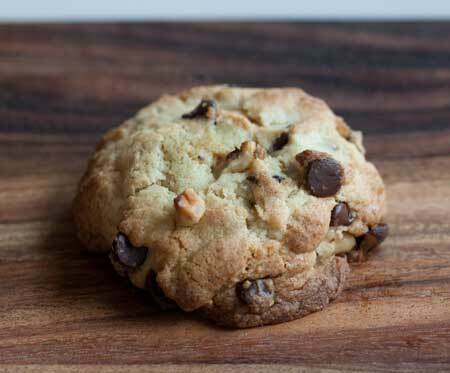 Adding dried milk makes the cookies a tiny bit softer, but it's not a crucial ingredient. Cornstarch curbs the spread a little bit, but I think a good chill overnight does a better job.